A versatile feature that has found its way into many bathrooms is the personal or handheld shower. Once considered a specialty item for people who needed the additional reach or convenience of this device, the handheld is now included in most bathroom remodels and many new home constructions – in addition to the fixed shower head or in place of it. The handheld shower once was used just in bathtub application when people wanted the ability to shower without the benefit of a shower head or by remaining seated – because they found being seated was safer or more convenient or they were unable to stand easily. They sat or reclined in the tub and used the handheld shower to bring the water to them. Now, the idea of having a handheld or personal shower in the master bath or secondary bathrooms has caught on, and it is widely used. It can be used as it has been traditionally for the bathtub in a seated or reclined position, even when there is a shower head present. This keeps the water spray to a minimum and reduces the possibility of the floor outside the tub becoming soaked even without glass doors, a splash panel or a shower curtain – although a shower curtain affords some privacy, provides a little warmth, and keeps the water spray inside the tub area. 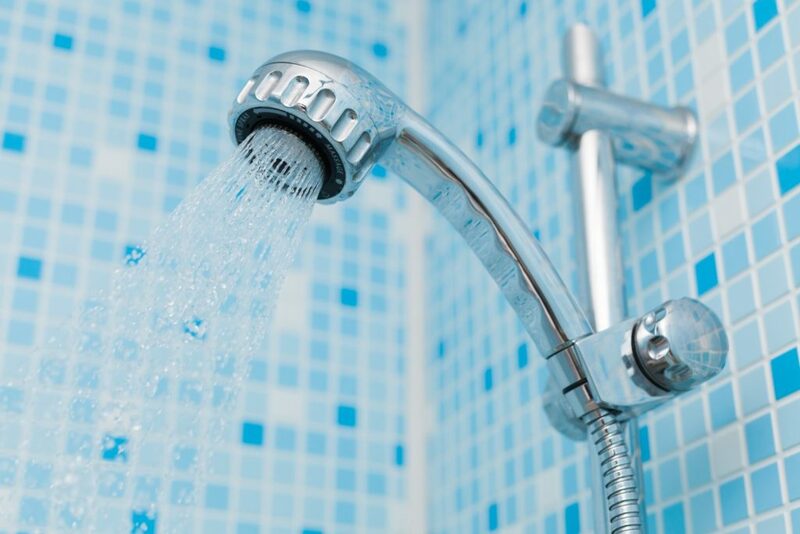 It’s not necessary that someone has a special need in order to have a handheld shower because they are in such widespread use today; however, there several considerations that need to be taken into account in order to maximize the effectiveness of this device. The handheld or personal shower is an important element of aging in place design. It’s also part of a universal design approach because it can be used by anyone (even those who might not be able to reach it to retrieve it from it’s resting or mounted position if someone does this for them and hands it to them). Considerations for installing and using this bathing device begin with the location of it. Sometimes it is installed as part of the fixed shower head with the supply hose coming off it. Sometimes it is installed toward the back of the shower with separate mixing or diverter controls. Sometimes it is installed on an adjustable slide bar in place of a traditional shower head to be used in place as a shower or detached for use as a handheld unit. If it is installed on an adjustable slide bar where the height of the handheld shower spray can be raised or lowered to use in place or detached to be moved to a location in the shower with a bench or fold-down seat, it must not be so high as to prevent the average person from reaching it to adjust it or to detach it. The bar itself must be rated as “ADA compliant” so that it can serve as a grab bar because whether it is so rated or not, people will grab onto it for support because it is there. In a slip or panic, this is even more important. There must be an on-off control on the handheld unit itself – on the handle or wand or on the head. Be careful because often a flow control slide switch will look like a flow switch. Only part of the units available for purchase have this feature but it is so important for safety and convenience because the user can turn it on or off as they desire and keep the unit from spraying water about while they let it dangle or try to rest it on a seat or continue holding it. The hose from the wall to the handheld shower itself must be long enough to allow the shower to reach from where the water supply connection is to where it will be used – too short and it is impractical while too long could result in excess hose that could become a tripping hazard. It should allow a comfortable extension without being either shorter or longer than it needs to be to sit and use it where there is a bench or seat. As for the seat, it can be a built-in bench as long as it is sloped properly to allow for drainage and to keep water from pooling and remaining on the sitting surface. Also, the material should be such that wet skin will not adhere to it because a person needs to be able to move about easily and without discomfort in the shower. It can be a fold-down style also. This allows it to be used as necessary and folded flat against the wall when not needed. Finally, there should be one or more cradles or rests attached to the wall near the seat where the user can place the handheld unit – with the flow turned off – while they rest or continue their shower before needing it again. To maximize the function and usefulness of the handheld or personal shower – now a common element in new and remodeled shower areas – observe these outlined considerations.